Quick background... I'm an American who lived in Finland (Pori) for about two years, and was fortunate enough to meet the woman of my dreams. That was 13 years ago, and we've been happy ever since, living in the US, Korea and now the UK. Since having kids about seven years ago, we don't spend Christmas in Finland anymore, but do travel back on boxing day or the day after. Each year it's a challenge to find a good ham that meets the high standard that joulukinkku sets with regard to taste. My wife and I have had lengthy, passionate discussions about Finnish Christmas ham. I'm of the position the "typical" Finnish ham is wet-cured (brined), but obviously not cured with the nitrites that normally turn the ham pink, and not overly-salted (as is the case with some UK hams that require soaking prior to cooking). In the UK, this would be called "gammon", a word that I actually had to look up some years ago as a native "American English" speaker. I would appreciate to understand the positions of the Finland Forum members on this critical, yet delicious issue. Re: What's Up With Joulukinkku? Thedukeofno wrote: Each year it's a challenge to find a good ham that meets the high standard that joulukinkku sets with regard to taste. At this point I thought your post might be a joke. I hate Finnish Christmas ham - it really turns my stomach. You could be right. It is that horrible wet texture that I cannot abide. In the UK, this would be called "gammon", a word that I actually had to look up some years ago as a native "American English" speaker. I'm not 100% sure what you are saying here. Are you suggesting that in the UK gammon would be similar to Finnish Christmas ham? If so, as a native speaker of "English English". I would have to disagree. Gammon in the UK is not something I am overly fond of but I do eat it occasionally. I would not touch it with a barge pole if it were similar to Finnish Christmas ham. That's called "juicy". That and "tender" are two words I wouldn't associate with meat in the UK. Sounds as if we've had different experiences, both with Finnish Christmas ham & English gammon. Thedukeofno wrote: That's called "juicy". That and "tender" are two words I wouldn't associate with meat in the UK. Tastes & experiences obviously differ but I would describe Finnish Christmas ham as more slimy than juicy. It just isn't something I care for at all. As far as meat in the UK goes, I think there is quite a range. I have had good and bad, so would not generalise. The point I was trying to make though is that I would not consider Finnish Christmas ham to be the same thing as gammon in the UK. I don't think I have ever had anything like Christmas ham in the UK, nor have I had anything like gammon in Finland. Technically Finnish Christmas ham and British gammon are both cured pork from the hind leg of the beast. In the UK, Gammon is rarely sold as a whole ham, rather it is sold in smaller pieces - thick 'slices', off the bone. In my experience, UK gammon is very pink and as salty as bacon, not particulary nice. Nowadays it is not uncommon for the Finnish Christmas ham to come from the front leg because it is smaller. A traditional Finnish joulukinkku on the bone would weigh in (pre-curing) at over 10 kg. When I picked up mine from a farm a couple of weeks ago it was 13 kg. We are wet curing ours which is not my choice, I wanted to dry cure. So I have delegated the task to my other half and if it turns out bad, it will be his fault. The main reason we are curing our own is to save money. An organic ham, ready to cook, costs a fortune. But we all like it, so as long as we don't mess up the curing process, it will all get eaten. As for cooking, it roast super slowly in the oven and then the skin is removed and we coat the fat in mustard/honey and breadcrumbs before putting the whole thing back in the oven for a final blast. What do you mean when you say it is slimy? Which bit is slimy? Supermarket hams are cured by injecting brine into the meat (which also adds weight, as is a faster process) - maybe that makes it 'slimy' - not sure since it's years since I bought a joulukinkku from the supermarket. Rosamunda wrote: Technically Finnish Christmas ham and British gammon are both cured pork from the hind leg of the beast. In the UK, Gammon is rarely sold as a whole ham, rather it is sold in smaller pieces - thick 'slices', off the bone. In my experience, UK gammon is very pink and as salty as bacon, not particulary nice. Yes, I can agree with that. Not particularly nice, although edible occasionally. I'm not sure whether it is the rose-coloured spectacles of nostalgia but I seem to remember gammon in my youth was thicker slices and more tasty than is common currently, but I have never eaten it often enough to be anything like an expert. I mean the meat rather than the skin or fat layer, but I can't be more specific than that. I don't actually know but I would assume that the joulukinkku I have tried all came from supermarkets. I have never tried cooking it myself. DMC wrote: I mean the meat rather than the skin or fat layer, but I can't be more specific than that. I don't actually know but I would assume that the joulukinkku I have tried all came from supermarkets. I have never tried cooking it myself. I don't know what you've been having, but joulukinkku as it's usually prepared (cooked on the bone in an oven at a low temperature until 75-80C inside), definitely isn't under-cooked or "slimy", if anything it can be slightly overcooked. It's quite different from various packaged and often pre-sliced meat products sold as "kinkku". The meat in your photo does look appetising, and no, that does not look like the joulukinkku I have had. I don't know how the meat I have been served has been cooked, so can't comment on that. There seems to be a confusion in the ham salting terminology above. Joulukinkku can be either gray-salted (harmaasuolattu), red-salted (punasuolattu) or fresh-salted (tuoresuolattu). The gray-salted Christmas ham is salted with salt that does not contain any nitrite. Red-salted ham, in turn, contains nitrite. - Most people tend to avoid nitrites as additives in their food. The term "fresh-salted" may be used in the name or label of a Christmas ham only if the product is freshly stored before salting. Fresh-salted ham is mostly gray-salted ham for which no nitrites have been used for salting. Thanks for the info on the different kinds of brine. Ours (post higher up) was grey salted so no nitrates but it does retain some pinkishness; it's not completely grey! I was worried ours would be too salty because we wet brined it for almost 3 weeks but amazingly it turned out really well so will definitely DIY again next year. Our only problem was getting it back up to room temperature before putting it in the oven. That took way longer than we expected. Here' a way to avoid your 2 challenges with Joulukinkku, i.e. too much salt and not the right temperature for baking. With this method you'll be able to get a frozen ham to correct room temperature on time for baking it. Buy a frozen ham in a supermarket a few days before Christmas Eve. At home remove the packaging and sink the frozen ham in a "bath" of cold water. Let the ham in the water stay in room temperature for 3 days. - By that time the ham will defrosted and the water with the ham will also reach room temperature. So the timing is important here. Go to the supermarket to buy the frozen ham on Dec 20th, so that you'll be able to bake it on Dec 23rd. After baking, the ham will be able cool down and be ready for eating on Christmas eve the 24th. A very handy way is to use a clean black waste sack as a lining for the "bath". This way you can just dispose it after ham is ready, and you don't need to do any cleaning of the tub after the salty and greasy water. 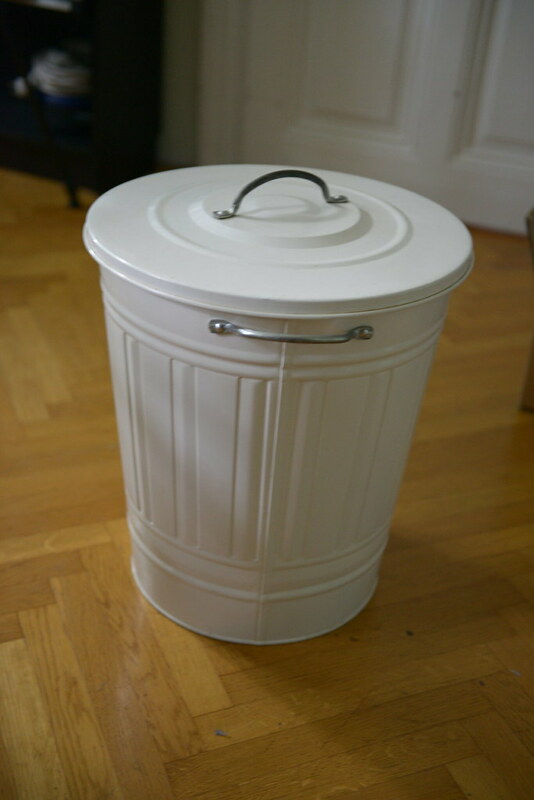 - I'm using a large metal bin with a lid (Knodd from Ikea) for the kinkku "bath". Our ham was not frozen. It was standing in brine in a bin (like yours but plastic) for about three weeks at 0-5degs because we cured it ourselves. I put a meat thermometer into it to watch the core temperature rise but it took almost two days to reach room temperature.